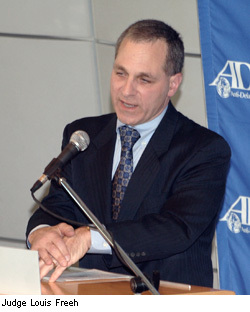 Former FBI Director Louis Freeh nearly struck two cars and a motorcycle head-on at a high rate of speed, one of the drivers told police, the Burlington Free Press reports. Van Coleman said the drivers took evasive action to avoid a collision after Freeh’s SUV swerved into the left lane of Vermont 12. Coleman told the Free Press that Freeh was “was doing about 60 to 65 miles per hour and was on the left side of the road.” The speed limit was 50 mph. Freeh’s car swerved off the road and into a tree. He was seriously injured. “His head was down, so I thought he had fallen asleep,” Coleman said. Posted: 9/10/14 at 10:31 AM under News Story.